NEW BOSTON – New Boston senior Tyler Caldwell isn’t your typical 6’7” player. You would maybe expect someone with Caldwell’s size to be a force on the inside, grabbing rebounds over anyone smaller than himself. But the fact of the matter is that Caldwell is a 6’7” guard who can do a little bit of everything on the court. He grew up a guard, and eventually hit a growth spurt that led him to be the size he is today, in true Anthony Davis fashion. His background as a guard leads him to play on the perimeter mostly, but can always go inside whenever needed. That perimeter play helped the senior Tiger break a Glenwood High School record for most three’s in a game by hitting 10 long balls and scoring a career high 41 points in a home win over school rival East on Friday, 106-57. But that wasn’t the only thing Caldwell accomplished in the Tigers lopsided win over their rival. During the same contest, Caldwell scored his 1,000th career point, an accomplishment every player hopes to achieve at the high school level. That achievement wasn’t just a special moment for Caldwell to signify what he had accomplished in that moment, but for the years of hard work the senior had put in to improve his craft. Caldwell hasn’t just grown as a person and a player over his four years in high school, but he’s also grown a significant amount between December 1st and today. 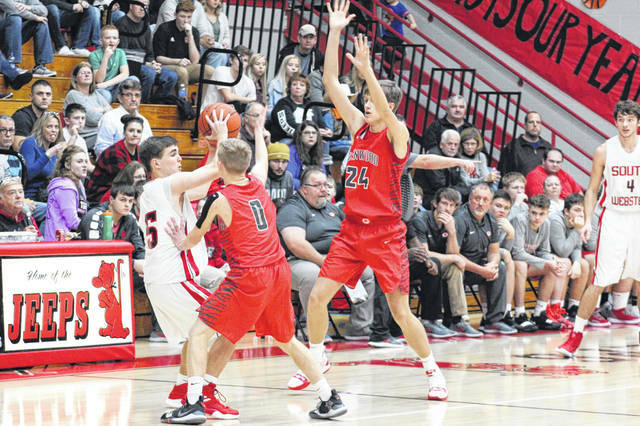 For those who might not recall, Caldwell had the chance to put his Tigers up by two points on the road at South Webster, a rematch of last season’s district semifinals, after being fouled on a three point attempt with just a few seconds remaining in the game. The senior missed all three free throws when he stepped to the line, but he says instead of letting that moment get him down on himself, he used it as encouragement and motivation for the rest of his senior season. As it stands today, the New Boston Tigers currently stand at 10-4 and tied for second at 7-2 in the SOC I. With a road trip to Latham to face the Western Indians looming, as well as home contests against SOC I leader Eastern and the much improved Green Bobcats, Caldwell knows just how tough it will be for the Tigers to close out their season on a high note. As the end of his senior season approaches, and we inch closer and closer to tournament play for all area teams, Caldwell wants himself and his team to leave a lasting legacy for future New Boston teams to reflect on. New Boston will travel to Clay on Friday in hopes to pick up a road SOC I win.